Iron Craft Challenge 48 is to create a wreath. I decided to make an ornament. Take a sheet of green felt. Cut it into 4ths lengthwise so that you have 4 long strips. 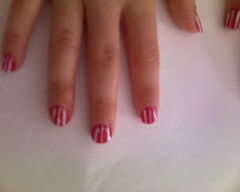 Then, cut those strips into squares. 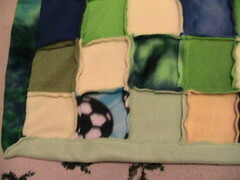 Mine were about and inch or so, not perfect, but that's ok. Take each square and cut it into a circle. 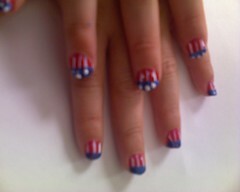 Just free hand it, if the circles are uneven, it will look better in the end. If you held several pieces of felt together when you were cutting, separate them and out into a pile, so they get mixed up. 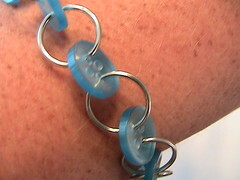 Then with a needle and thread, string the circles by inserting the needle half way between the center of the circle and the edge (If you do it in the center, you'll need more circles to have enough to make a wreath, doing it offset, allows for the center to be bigger with this amount of circles). Once all of them are strung, tie them in to a circle. 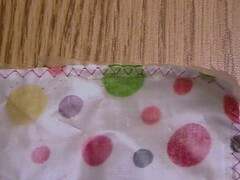 I sewed around one more time just to make sure it was secure. 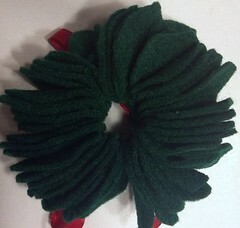 Then, I sewed a bow of red ribbon on the front and then I sewed a loop of ribbon between two of the green circles to hang it from. I considered adding some beads or fabric paint ornaments, but decided not to. For the first time since I started the Iron Craft Challenges, I missed posting my craft. It was for the Fall Contest Challenge. You know what the sad part is? It was one of the few times that I knew right away beyond a doubt was I was going to do. 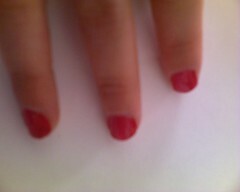 And I actually did complete the challenge, I just never got around to taking a picture of it! Things are really starting to pick up here for the holidays! For the Fall contest, I decided to do a Thankful Arrangement. I cut out leaf shapes from scrapbook paper, punch a hole in them put some string through the hole and then gave them to my daughters to write things they're thankful for on them. 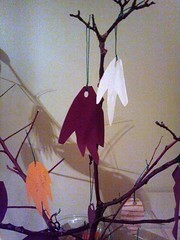 Then, I hung them from some branches that I placed in a vase filled with silk leaves and tied with a ribbon. 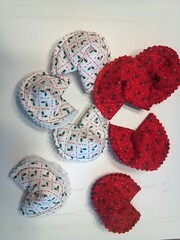 For Iron Craft Challenge #46, I got back in the game and made some fabric fortune cookies for my grandmother. I bought a plastic Chinese take-out container to put them in. She'll be able to open one each day in December, or would be, if I had gotten them in the mail on time! Iron Craft Challenge #47 was "For the Table". My favorite center piece for the table this time of year is really simple. I take a glass bowl (usually a crystal one), fill it with water, pour in some cranberries and then float about 3 floating candles in it. There should be enough cranberries to cover the top of the water and I think that white candles look best. But is that really a craft? I was going to do anyway, but I forgot to take a picture of it before guests arrived for my party early on in the week and didn't have any more floating candles left to do it again. So, all I had was this really bad picture. Now, I think I'm back on track. Stay tuned for my craft for IC 48! They're feet for my sewing machine. My mom's friend gave them to me (this is only a portion of the ones she gave me) along with a 2 inch three ring binder of instructions on what I can do with them. It turns out that the binder only covers what I can do with some of the extra feet I was given! Very intimidating for this girl who feels adventurous using the foot that makes a rolled hem! Couple that with my thriftiness (ie not wanting to pay to have things quilted), the three quilt tops I've got almost ready and this post at Crazy Mom Quilts. Surely with all those fancy feet, there was one for free motion quilting? There was! So, this week, I tackled my fear of the feet and my fear of machine quilting on my little old sewing machine. I think that's it's probably something I'd be able to do if I had a lot more practice, but in the mean time, I'm going to look at alternatives for quilting the quilts I've got. Check out the IronCraft Flickr pool to see what everyone else was afraid of! This week's IronCraft Challenge theme is Boo! Halloween crafts. 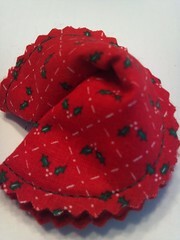 I saw this hanky tutorial and liked the way the edges were done. So, I decided to adapt it a bit. Cut the fabric into squares I did fat quarters, but in looking at them compared to store bought napkins, they're a lot bigger, so you could do something smaller. Then lay the stencil on the fabric and with a pen or pencil trace the edge of the stencil around the square of fabric about half an inch in from the edge. With your sewing machine set to a zig zag stitch that's pretty narrow and close together, sew on the line that you just drew around the edge of the fabric. 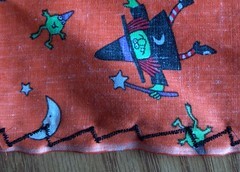 Next with sharp scissors cut the fabric away, as close to the stitches as you can get without cutting them. 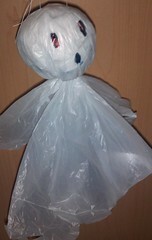 Do you have any fun Halloween craft ideas? 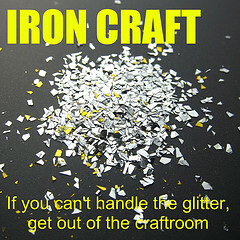 Over at Just Crafty Enough, the Iron Craft Challenge is Hold it. We're to make a case or a bag. I recently got a new phone. It was a new model that had just came out and there aren't many accessories for it. The only case that Best Buy had when I bought it was a black one. I really was hoping to get something a little more fancy since I couldn't do that with my old phone. So I started thinking about making one, not one that is a pocket for my phone, but one that I can leave on while I'm using it. So, I looked through my fabric stash, found a piece I liked and decided to try making my own. First, I took a piece of paper and traced around my phone. Then, I took a ruler and added two inches to the top and bottom and one inch (twice the thickness of my phone) to each side and drew a larger rectangle around the tracing I had made before. 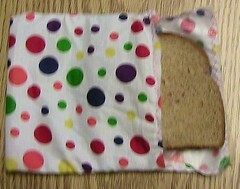 Next, cut out the rectangle and use it as a pattern to cut out the fabric. 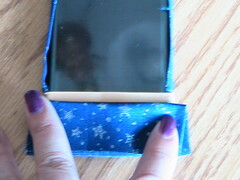 Fold the long edges down 1/2 inch (the thickness of my phone) and sew both sides. 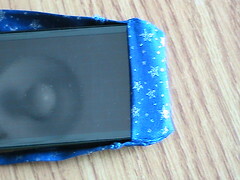 Next lay the phone in the center of the fabric, with the RIGHT side facing up. 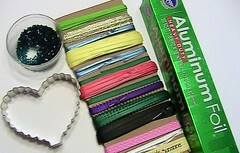 Bring the sides up and hold them there with a couple of rubber bands. Next fold up the ends to where you want them. Ideally, not covering the screen or any buttons, but in my case in order to stay on, it has to cover the buttons, but I can still keep it from covering the screen. Now, with needle and thread sew the corners and up the side a bit so that the bottom is closed. 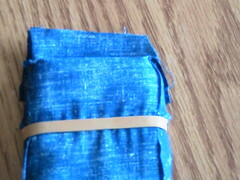 Then trim the excess fabric. 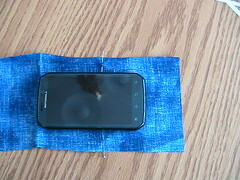 Next, I took it off the phone, turned it right side out and tested the fit. It fit pretty well, so I did the same thing with the other end. Then I turned it right side out and checked the fit. I was surprised by how easily it comes off and goes on. 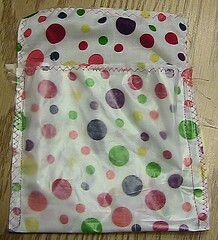 I was also surprised that the buttons work ok even through the fabric (including the non hard ones). So I don't need to cut a hole out of the bottom piece like I was originally planning to, unless I have problems remembering which one is which. I'm planning on cutting holes out for the camera on the back and the top. This week's Iron Craft Challenge is another color challenge. I almost did some silhouettes for this week, but didn't have the time. So I decided to do one for Halloween that I did last year. Cut the front off the bag and trim off the handles. 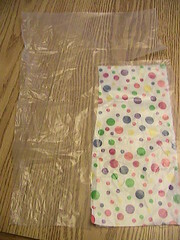 Ball up the front of the bag, the handles and another bag, and wrap the back of the bag around it. Then tie just below the ball with a piece of string. With the marker, draw on a face. Using the needle, run a piece of string through the top part of the ball to tie it to the tree. 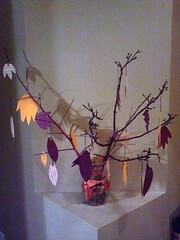 Usually, I make a bunch and just tie them to the tree in my front yard and then cut them off after Halloween is over. What's your favorite Black and White craft? Check out the Iron Craft Pool for other ideas. We've gone back to school here and with it came an onslaught of forms to fill out. This year I've got two kids in school and I'm filling out the same forms for both of them and they're also the same forms that I filled out LAST year. So, I scanned the forms using my scanner and then filled out the forms on the computer so I could just change the stuff that was different between each child. I just used a photo editing program on my mac to do it (MSPaint would work on Windows), but you could OCR the form, if your scanning software supports it, and then edit it in Word or OpenOffice.org. Then I saved a copy of each form so I can just update the new stuff next year. Alternatively, if you're not that computer savvy you can fill out the common information for the forms, make a copy of the form and then finish filling it out for each child. I did that last year, and saved a copy for this year, but realized it would be easier to read if I typed it. My handwritting isn't very neat anymore now that I type pretty much everything! This has worked for me for school forms and other forms as well, anything that I need to fill out for both kids. It works best if the form is on white paper too. 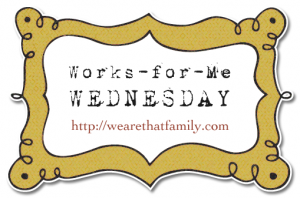 For more great tips, check out Works for Me Wednesday over at We Are that Family. This week's Iron Craft challenge at Just Craft Enough was to use a book. We're all readers here at this house, even my kindergardener who can't read will have us read to her over and over. So the idea of crafting with a book, even one that I didn't care for wasn't something I could bring myself to do. 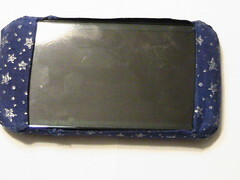 (Although afterwards I realized I think I've got some with water damage that might not be readable anymore I could use.) I do however get an excessive number of phone books each year. I need to look into asking them to stop but haven't gotten to it yet. So I took a phone book and loosely followed these instructions. Originally I was going to paint it all blue with a yellow center, but my daughters saw it and decided they wanted to decorate it, so for now, I've left it as is. 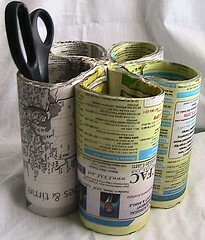 Any other creative uses for phone books? I used to cover them with paper and then contact paper and use them as stools for the kids (I even personalized them), but our phone books here aren't as big and the girls no longer need stools as much. I also use them as a working pad when I'm cutting or gluing. 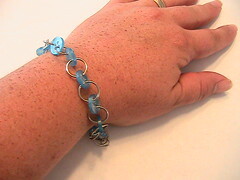 This week's Iron Craft Challenge at Just Crafty Enough is On the Go. 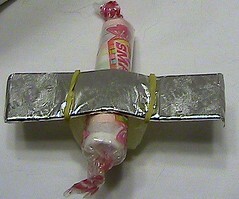 So I made some of the candy airplanes that my Mom used to make for party favors growing up. 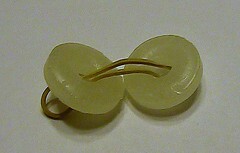 Step 1: Feed the rubber band through the holes in the Lifesavers. 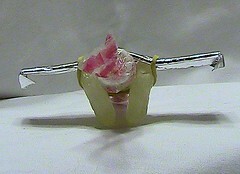 Hook both ends of the rubber band over the ends of the stick of gum. 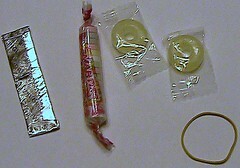 Use a finger to spread the Lifesavers apart and slide the roll of Smarties in between the lifesavers and in between the rubber band and the stick of gum. Slide it so that the stick of gum is about 1/3 of the way back the roll of Smarties. 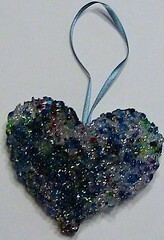 This week at Just Crafty, the Iron Craft challenge is finishing unfinished projects. Boy oh boy, is this one right up my ally! Proof of that? I didn't find out what the challenge was until yesterday (Tuesday) but, still managed to have three things to share! I finished my backpack make over. I finished this blanket for my friend who is collecting blankets to send to Mexico. 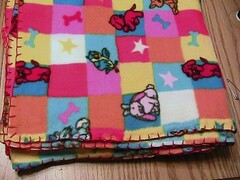 She's been making the no sew fleece blankets with some other friends and saving the scraps of fleece. I got a box of them over a month ago and started several quilts with them. 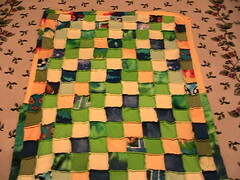 This one was pretty close to being done I just had to add a little bit to the sides to make it wider and then add the binding. 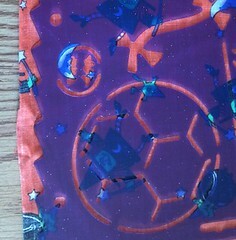 Then, I had this fleece blanket which was just a piece of fleece that I started to blanket stitched around the edge a few years ago. It's been hanging out in my laundry room waiting for me to finish it. I'd bought it to make a blanket for my youngest to use for naps at Day Care. 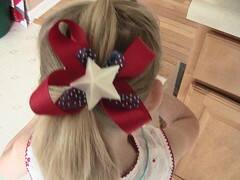 However, she's going into Kindergarten this year and no longer taking naps. Now, it's going to the same charity as the other blanket. Had I found out about the challenge theme earlier, I might've picked the knit socks I've got hanging around, or maybe my Pi shawl, or maybe the quilts I'm making for my daughters, or maybe... Ok, I think we need to do this challenge again LOL. A few years ago, I found some brand new backpacks at Good Will for $2.50, but, I didn't like the design that was on them. I picked up a couple of them anyway though intending to give them a make over. 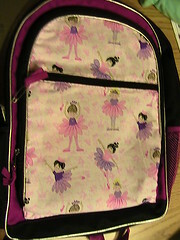 This year, I was intending to get some princess fabric to decorate one for my youngest, but she decided she wanted a ballerina backpack. So, I bought some fabric with ballerinas on it, cut it to size (with about a half inch extra on all 4 sides to turn under), then I sewed around the edges turning the raw edges under as I went. I did the stitching by hand because I wasn't sure that I'd be able to manipulate the backpack with my machine enough to do a good job. 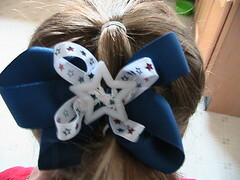 After I finished sewing it, I sprayed it good with Scotch Gaurd. 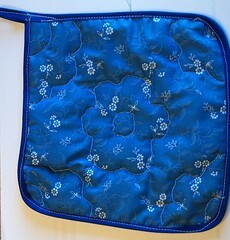 The fabric will attract dirt faster than the canvas part of the backpack, so I wanted to counter act that. So, now my daughter has a backpack with the design of her choice and there's not likely to be anyone else in Kindergarten with one like it. This would work well too for the times when your child out grows the theme of their backpack but it's still in good shape. This week's challenge is the summer contest. 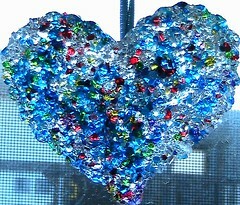 I decided to make a sun catcher. A friend gave me a big box of little jars of the plastic pellets left over from sun catchers. It looked like someone had saved all the leftovers from various kits. There were only a few of the metal frames in the box, mostly it was just the plastic pellets. I'd been thinking about what I could use them for, various ways of making my own frames, etc. I saw where someone had made frames out of soda cans. Problem is we don't drink much soda here and didn't have any cans. So I decided to improvise. 2) Take another piece of foil and line the cookie cutter with it (I took strips a little wider than the cookie cutter was tall and ran them around the inside, wrapping the foil over the edges, trying to get it as tight against the cookie cutter as possible. 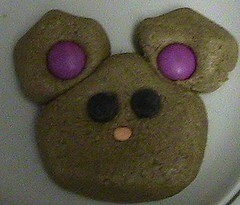 3) Sit the cookie cutter on the cookie sheet and fill it with the plastic pellets. Since there's no frame to stabilize this when we're done, I filled mine pretty full (1cm deep). 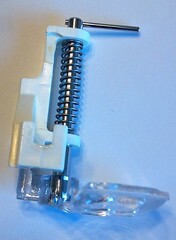 4) Bake according to the instructions with the suncatcher plastic pieces. I did mine at 375 for 20 min. 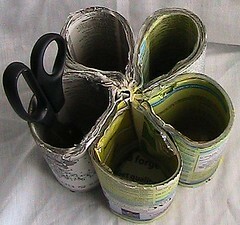 Iron Craft has moved to Just Crafty Enough and this week's challenge is Sculptural. We were to make something with clay. If you recall, I used polymer clay back for the Hometown challenge. And while I'm not opposed to making beads or some other kind of jewelry, I was trying to think of something different to make. That's when I remembered this playdough that I made a few years ago. So I decided to make some of it and to make a teddy bear out of it. You might need to add more graham cracker crumbs or powdered sugar to keep the dough from getting too sticky. I embellished my bear with M&Ms, Chocolate Chips and a sprinkle (for the nose). It's getting close to that time, stores have their back to school supplies on sale. I took my youngest shopping for a new outfit for her to wear the first day of school. We hadn't even left the store yet before she was asking how many days until she starts school. She's just a *wee* bit excited about this next step! After getting asked a number of times the rest of the day, I finally asked her if she wanted to make a chain to count down. So, that is what we did. I've made it into a pdf for you to print. Some of the graphics are from WebWeaver.